The Co-op celebrated our 40th anniversary at our annual membership meeting on Saturday, October 28, at the Olympia Center in downtown. If you weren’t one of the 300 or so folks who came by to join the fun, I can report that it was a definite success! We’re never sure what kind of turnout we’ll have for our events, so our party planners were so glad to see all the participation – even one of our founding members, Gregory Reinemer, made an appearance and got a round of applause. It was obvious how much our community has gratitude and appreciation for what we’ve cooperatively achieved over the years. The event began with our business portion, skillfully introduced and emceed by the talented Grace Cox, also our longest serving collective staff member. Erin Majors, who comanages the westside produce department as well as teaching cooking classes through our community classes program, provided the foundation speech for our celebration of 40 years of Co-op local. Erin shared some of the things she treasures most about her work and experience at the Co-op, primarily the fantastic local foods and products that are such a big part of what makes the Co-op so special. As most of you probably know, starting a farm or a small business is no easy feat. Many local producers continue to work other full time or part time jobs while pursuing their dreams of starting their own businesses. At the same time, these producers show the care they take in sourcing good quality ingredients, the time and attention they give to packaging and product design, and the love they have for trying out new flavors and products. In the time Erin has worked at the Co-op, she’s seen local food businesses flourish! Much thanks must go out to Co-op members for supporting local producers with your shopping dollars – you have played a huge role in helping to strengthen our local food economy. Interested in learning more about what we mean by Co-op local? On our website under the “go local” tab, you can find a listing of many of the local vendors we buy from as well as a description of the Co-op’s local farms program. You can also find a new section featuring local producer videos. Earlier this summer, Robyn Wagoner, a staff member on our outreach team, and the 40 year campaign coordinator, began working, along with her son Justis, on making short films about the local farmers and producers the Co-op works with. Currently, three of these short films have been completed – one featuring Calliope Farm, one featuring Yoga Way of Life, and one featuring Flying Cow Creamery. The outreach team has also been working on making posters and small signs that feature our local producers. Look for these hanging in our stores. We hope to add more soon! Erin also spent some time appreciating other beloved work that makes the Co-op different, such as our significant donations program, and some of the organizations we’ve helped with contributions of food as well as events such as produce drives to benefit the Thurston County Food Bank. Our round up at the register program was introduced by one of our Board Members, Desdra Dawning, who has acted as a liaison to the Community Sustaining Fund, our long standing register round up that has benefited hundreds of local groups and individuals over the years. Members of the Sustaining Fund board of directors came by to share about the program, as well as Emma , our staff member who serves on a Board committee called co-sound, which is sponsoring a current round up campaign for CECOSESOLA. Our round ups, gathered in bits of change from so many different shoppers since the 80’s, have helped with a number of causes over the years, from ongoing community support to national and international crises. More information about our current round ups are also available on our website. Alejandro Rugarcia, working member coordinator at the eastside, next spoke about our program and his time managing that work. You can’t appreciate the Co-op without appreciating our working members! So much care and hard work has been provided over members play a huge role in supporting our organization to be able to make it more financially feasible to offer local goods at a lower margin, they also play a huge role in creating a sense of community and participation, which is critical to the health of our organization. Jackie Krykek, another of our fabulous produce department managers, helped deepen the understanding of our local produce program by sharing data and statistics about what we sell and where it all comes from. Those who love spreadsheets got to see some cool data and we all learned how extensive the offerings of local produce are in the South Sound. She also helped share the perspective of how much all grocery stores use “local” as a marketing tool and what the difference is for our stores – when we say Co-op local, we mean it! The finance report came next, provided by Max Crabapple, a member of the finance coordination team, who had some good news and some okay news and some great news to offer – the usual mixed bag of finances. You can read more about our financial picture in the report on page 16. Max also talked about the change to our discount structure and how that has been such a major project of this year and last, with the goal of improving the long term financial stability of the Co-op. Your author on this piece here had the pleasure of offering this year’s staff report, and feeling that so many topics were being covered in other parts of our agenda, I chose to call out a list of our long term staff; the old schoolers, old timers, the ones who’ve lasted 20 years or more in our fascinating staff collective. We even have five staff members who’ve been with the Co-op 30 years or more! I think this is a testament to both the committed individuals we have working here and the unique nature of our organization that provides employment to more than 80 collective staff members who work together, without hierarchy, to manage our business. Our 20 year plus staff includes: Mary Jane Cason, Martha Chubb, Grace Cox, Margaret] Culbertson, Gary Galbreath, Ami Greenberg, Kitty Koppelman, Barbara L’Aimont, Eion McReady, Virginia Lange, Harry Levine, Michael Lowsky, Pat Maley, Corey Mayer, Teresa McDowell, Todd Monette, Rebeca Roqueni, Maria Van Newkirk, and Michelle Weber. Thank you for all your years of dedication to the Co-op! The candidates for the Board of Directors had a chance to share their reasons for running for the Board this year, and thoughts about the Co-op, and we got to hear from Joanne McCaughan and Benjamin Witten. Many members took the opportunity to vote at the event, and you can see our election results on page 23. The member relations committee, made up of members at large Pat Kolstad, Linda Meyer, Mary Watt, Anita Langston; Board Members Casey Hook and Desdra Dawning; and staff members Tamara Urich-Rintz and Keziah Apuzen, spent months planning the food offerings for this party and also were invaluable in making all the logistics of the party and meeting work. Much thanks to them for making our celebration a success! Participants were treated to a lovely meal including Kenyan vegetarian dishes (beans and vegetable greens) from the Mazigazi Group (new owner of former Ben Moore’s restaurant); Venezuelan food (arepas, sweet and green plantains, chicken and chicken salad, black beans) from Arepa’s Food Truck; and desserts from Traditional N Exquisite baklavas, Smiling Mo’s gluten-free cookies, and Cobb’s vegan and gluten-free pumpkin cheesecake and mapley mocha cheesecake. We also got some help from Old School Pizzeria when we ran out of food for the hungry crowd! Luckily, we were also treated to some munchies from several local producers who took the time to come out on a Saturday night to help make our party a success. Many thanks go to Andre from the Bread Peddler, Elaine from Peace, Love & Raw, Habib from Exquisite N Traditional, Bob from Skokomish Mushrooms and Jen from 8 Arms Bakery. Once people found some food, we were treated to a full on Co-op movie, called ”Selling Co-operative.” This effort, created by Robyn and Justin Wagoner and Max Gordon was a fantastic documentary compilation of interviews, clips, photos and even included a music video about the free store. This was an amazing archival offering that really honors all the people who made the last 40 years happen. We don’t have permissions to publish all the pieces of the movie yet, so you can’t find it on youtube, but as soon as we have a version that we can publish, we will let you know. Many thanks again to all who participated in the movie and helped tell our complicated Co-op story. And finally, the evening ended with some drinks and music provided by Magellan, some raffle fun, and since we were so close to Halloween, a little costume contest for those who showed up in spirit. Many thanks to Laura Love, staff member and representative to the Board of Directors, who spent a good part of the year organizing this party and carrying forward all the fun and complexity that is our Co-op community. 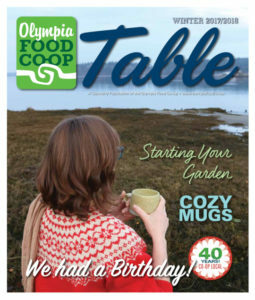 The Olympia Food Co-op is a fundamental part of so many people’s experience in our local community. We are fortunate to have amazing local producers, a vibrant working member program, a skilled staff collective, and you, our incredible and dedicated membership. We thank each of you for being a part of that and for celebrating 40 Years of Co-op local.